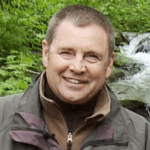 What is it about Oregon’s rivers? There is nothing like a cool, restful moment along the shady shoreline of a Oregon river. That sentiment is shared for an exciting outdoor adventure, fishing or paddling along one of our prized waterways. All this is especially true near Camp Sherman, where the Metolius River bubbles from the ground to curl and wind along an 8,600-acre river corridor. 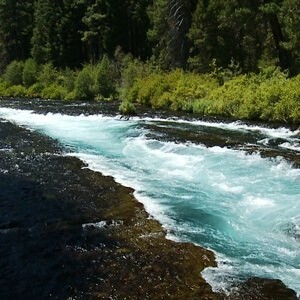 It’s so special that the Metolius has been protected as one of America’s Wild and Scenic Rivers since 1988. Jeff Perin, local fishing guide and owner of The Fly Fishers Place in nearby Sisters, likes it that way. Since 1947, the Oregon Department of Fish and Wildlife has operated the nearby Wizard Falls Hatchery. Steve Hamburger, a retired ODFW hatchery manager, said the 45-degree water is perfect for raising trout. More than 4 million baby trout are raised at Wizard Falls Hatchery to later be released into dozens of lakes and ponds across Oregon. 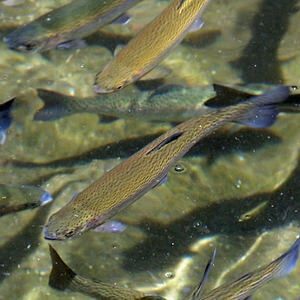 Visitors come from all over the state to stroll the 35-acre hatchery grounds that are more akin to a park land than a fish hatchery. Nearby campgrounds make the living easy too. There are 10 U.S. Forest Service Campgrounds along the Metolius River that offer a place to stay and relax, like Allen Springs. In September 2003, two major forest fires merged into a catastrophic blaze called the B&B Complex Fires. More than 2,300 fire fighters battled the B&B for 34 days at a cost pegged at $38 million. The huge blaze burned more than 90,00 acres along the crest of the Cascades near Mt. Jefferson. Today, you can travel the back roads, where pavement turns to gravel, and explore the scorched landscape above the Metolius arm of Lake Billy Chinook. 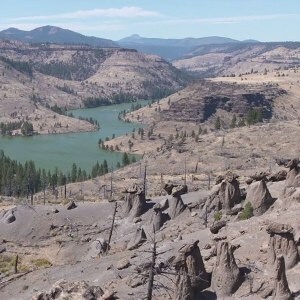 Here, the B&B burned everything down to bare soil, but it also revealed something unusual most folks had never seen: Oregon HooDoos, also known as balancing rocks and ghost rocks. This nest of unique rock pedestals — some 30 of them — are hardened capstones of an ancient lava flow. As the softer material erodes beneath the basalt rock, the pillars that support the caps can grow up to 25 feet tall. Geologists say the HooDoo formation process takes up to 20,000 years. 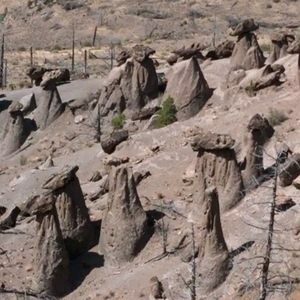 Sadly, several HooDoos have tumbled down to ground since the 19th century discovery. It’s a lonesome land where Oregon’s HooDoos stand guard — but it is worth your time for a visit to see one of Oregon’s stranger scenic areas.